Have you had Embutido? It’s basically meat-loaf, with a twist. 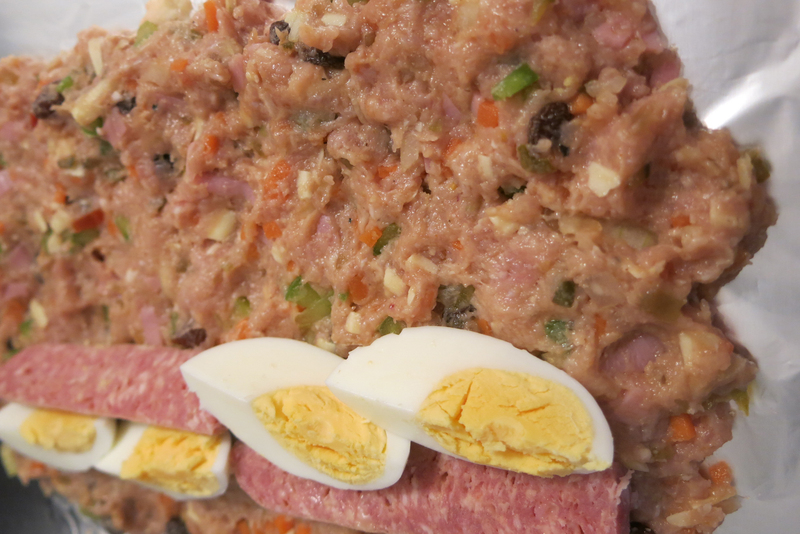 Compared to traditional meatloaf, embutido is quite colourful because you mix veggies and other bits and bobs with the meat. The recipes found asked for red and green bell peppers (or capsicums), pickle relish, sausages (not sausage meat) on top of the usual eggs, flour and seasoning. I didn’t have all the ingredients in the cupboard so I walked all the way to the supermarket during lunch to get what I needed. I was excited! 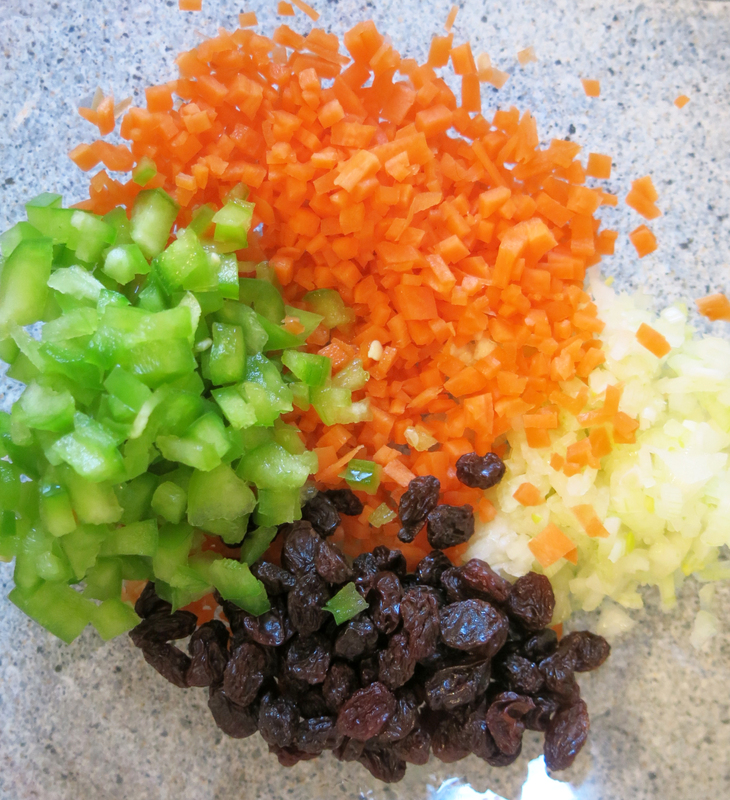 So, when I got home, instead of putting on my runners, I washed my hands and started chopping, and slicing and mincing. I started off with the onions, and then half a carrot, and then the green capsicum (I opted to not get a red one because it would have been wasteful, one was more than enough). I dumped in a handful of raisins and set these aside. Then, I mixed the ground pork, egg and breadcrumbs – the recipe called for 2 raw eggs but since I’ve kinda halved the amount of pork, I figured I probably don’t need as many eggs. So I just used 1 egg and estimated the amount of breadcrumbs I poured in. Afterwards, I put in the minced veggies, a couple of spoonfuls of sweet pickle relish, a handful of grated cheese, squirted a bit of tomato sauce, sprinkled in some salt and pepper (is it obvious that I’m now “winging it”?) and mixed again until everything was well incorporated. Meanwhile, 2 eggs were having a hot bath on the cook top. 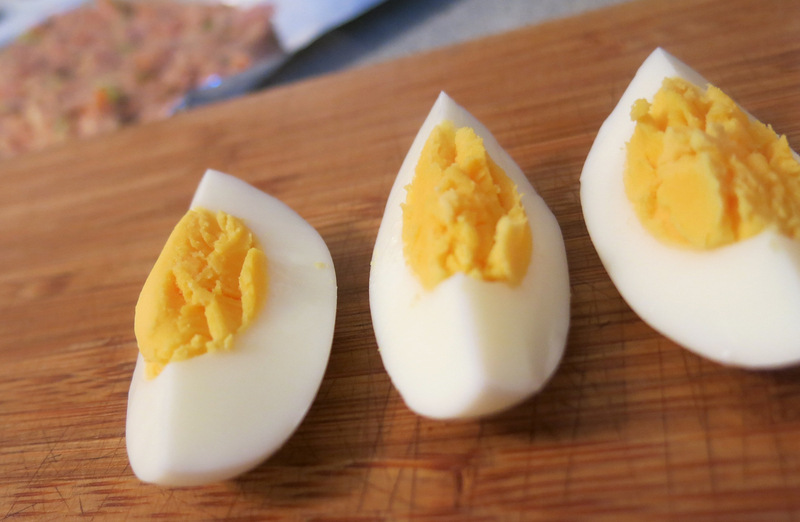 I needed 2 hard boiled eggs for the “filling”. When everything was ready, I tore off a bit of aluminum foil and laid out the meat mixture on it. I sliced the hard boiled eggs into wedges and put those quartered eggs on the meat mixture interspersed with a bit of cheese kransky (I couldn’t taste the cheese!). And then came the daunting task of rolling the whole mixture so that the eggs and cheese kransky (in lieu of the regular sausages) were completely covered by the meat. I managed to make 2 rolls (and an itty bitty one from excess meat) and I was ready. The recipe at Panlasang Pinoy said that the Embutido had to be steamed for an hour. I got the double boiler out and was halfway through boiling the water when I realised my smallest roll (no, not the itty bitty made from excess one) was too big to fit in it! OH MY GRACIOUS GOODNESS NO! So, I jumped on the internet and looked for the recipe on the Filipino Recipe Site which gave instructions on how to bake the embutido, for those who don’t have steamers. Whew! That saved the day. I obviously can’t make fairly accurate estimates on quantity. 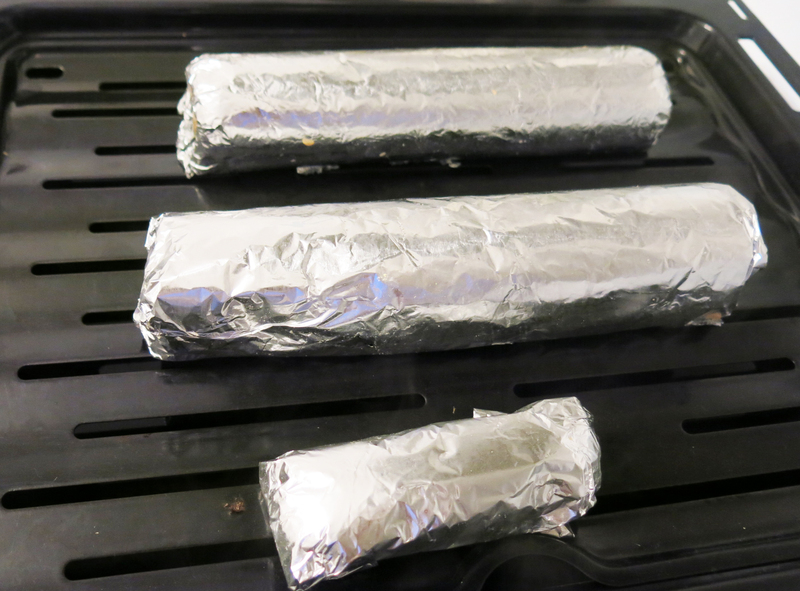 After leaving the foil-covered rolls inside the oven (at 175C) for about an hour, I got them out and of course — carefully removed the wrapping. It’s the moment of truth. I couldn’t breathe! Would the meat hold? Will it taste all right? Is it cooked? Turned out I was worrying for nothing, my embutido actually turned out pretty much okay! Look very good and I also like the ingredients. Next Next post: Babies … Lots of Babies!